Seyit Jemaletdin Mosque. 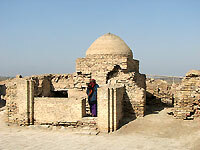 Among the small number of Timurid-era monuments on the territory of Turkmenistan, the mosque of Seyit Jemaletdin in Anau stanza out as the most brilliant. According to inscriptions on its facades and interior, it was built when Khoresm was ruled by Abu Kasim Baber Bahadurhan (1446-1457). Its construction was financed by his vizir, Muhammed Khudaiot, who chose a site near the grave of his father, Jemaletdin. One curious feature of the mosque is the mosaic above the entrance arch, depicting two enormous 8-9m high dragons facing each other. Their vivid yellow bodies contrast sharply with the deep blue mosaic background depicted on the facades of Central Asian buildings - especially religious structures. These were in sharp contradiction to the late-Islamic ban against depicting any living being in art. There has as yet been no fully satisfactory explanation for this curious detail above the entrance to the Anau mosque. The mosque is located 12km to the southeast of Ashgabat. The original mosque was completely destroyed in the 1948 earthquake. There are many folk legends connected with these dragons. One of them tells how a kind hearted queen lived long ago in the fortress, to which the people often brought their requests. They rang a bell hanging by the gates; when they heard the ringing bell, her servants would open the gates, listen to these requests, and give assistance to their petitioners. One day, the bell rang out loudly for longer than usual. The servants rushed to the gates and saw an enormous dragon ringing the bell with a beseeching look, without harming a soul. Somehow, he was able to explain that his mate needed help. The servants followed the dragon into the mountains and freed his mate from a goat whose horns had gotten caught in her mouth. In gratitude, both dragons brought many objects of great value to the fortress gates, and the queen ordered a magnificent mosque to be built for them. In this way the two dragons were immortalized on the mosque's entranceway.